I am in a bit of a panic trying to get everything done for the Fall photo shoot. An unexpected trip out of town cut into my knitting time. I think things are back on track now. Several lessons arrived while I was out of town but I was able to review them right away. For my non-US students, if you could send me an email when you send your lesson, I'd like to track how long it takes for me to get them and to get them back to you. I've noticed that it takes forever from some countries. I've reviewed a few lessons lately where the students have had difficulty recognizing the slant of the decreases. Since decreases require two stitches worked as one, one of the stitches is on top and then other is beneath. This determines the slant. In a K2tog, the left stitch is on top of the right stitch which makes the decrease slant to the right. 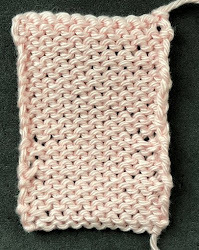 In an SSK, the right stitch is on top of the left stitch which makes the decrease slant to the left. In the photo below, there are arrows to indicate the stitch that is on top and the direction of the decrease. I've got stuff going on at home which makes it impossible for me to have visitors right now. Stay tuned. The Wine Dark Sea is finished. I wanted the neckline to be wider than a regular crew neck. All in all, I am very pleased. I've finished the body of the jacket. It is blocking. When it is dry I will do a wide reverse cable band around the neckline. This photograph is from a funny angle. I will do a better one next week. While this is blocking I started on the Confident Beginner garment. It is a very simple, unstructured sweater. The yarn is Swans Island. I know it looks small in this photo but the chest measurement is 36". It is designed to be the first sweater someone might knit. Hi Arenda, I think there is a typo above. SSK decreases slant to the left.